Currently all states except Massachusetts require out-of-state or mail-order pharmacies that ship drugs to their residents to obtain some form of Nonresident Pharmacy License in their state. 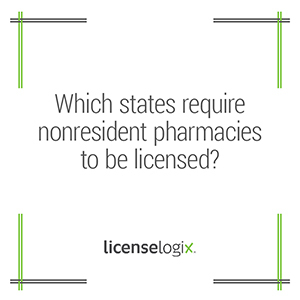 Nonresident pharmacy licensing is typically similar to in-state pharmacy licensing, with perhaps a few additional requirements such as the designation of an in-state representative to act as an agent for service of process and other local matters. Nonresident pharmacy rules differ from state to state; some states require acting pharmacists-in-charge to be licensed through their Board of Pharmacy, while others do not; certain states require nonresident pharmacies to file periodic reports of controlled substances dispensed to their residents. Regulations are always changing - Pennsylvania only recently enacted legislation establishing a nonresident pharmacy license requirement - so it is important to stay abreast of developing legislation in order to remain compliant in the industry. LicenseLogix helps clients stay on top of new requirements and changing regulations. Contact your LicenseLogix Account Manager or get a free quote!